Dahl's study from 1960 was groundbreaking in that it turned to human populations to look for the evidence of salt-hypertension link. Dahl's data was scarce, and of uncertain quality, but the dramatic correlation between salt and hypertension it showed made big impact on people's minds. It convinced many - beginning with medical professional - that current salt consumption is, indeed, major health hazard. Its effect was so powerful that nearly quarter century latter the National Heart, Lung and Blood Institute (NHLBI) decided to follow its steps with the largest ever observational study of the link between salt and hypertension, Intersalt. The study spread to 32 world countries, and was confidently expected by the NHLBI to confirm Dahl's findings, lending decisive support to salt hypothesis and their health policy based on it. But things did not go as expected. Let's take a closer look at these to studies. ∎ Dahl chooses not to consider factors other than salt that could affect the rates of hypertension; when directly addressing "factors other than salt", Dahl merely states that such "have been omitted from this discussion" (? ), only digressing to inheritance factor, with no attempt to articulate its possible effect on his general concept. ∎ He dismisses report which found that a population of Eskimos had hypertension rates as high as those in the U.S. (Serum cholesterol levels and blood pressure of Alaskan Eskimo men, Scott et al, 1958), objecting that those Eskimos "were not primitives" anymore; civilized vs. primitive lifestyle, however, was entirely ignored as a possible hypertension factor in constructing his own concept. As a side note, according to Robinhold and Rice in Cardiovascular Health of Wainwright Eskimos, despite significant rise in the heart diseases rate in Alaskan Eskimos from 1950 to 1960, approaching those of U.S. mainland, as of 1960 their heart-related death rates were still nearly five times lower than for the U.S. population as a whole - a discrepancy certainly affected by the relatively short average life span of Eskimos. Since rate of hypertension also tends to rise with age, it was an important, and rather obvious confounding factor neglected in constructing Dahl's famous salt-hypertension plot. ∎ Dahl is very manipulative in selection and interpretation of available information; as the evidence showing that it is "highly unlikely" that salt appetite is inherent, he points to: (1) the ability of his patients to adjust to a significant reduction in salt intake without showing signs of salt craving, (2) comments of individuals on diets with 0.1-0.25g daily salt intake that adding extra 0.5-1g makes food "too salty", while those consuming 10-20g of salt do not notice 50% increase in added salt (fair comparison would be more like 4-5 times increase for the latter). That suits well his concept of salt consumption being unrelated to the actual needs (i.e. "induced"), but flatly ignores that the common - up to tenfold wide - variations in individual salt intake, even within fairly isolated, culturally uniform groups of people such as Eskimos or Marshall Islands inhabitants in his report, clearly suggest that the need for salt in humans is not acquired, and that it is neither uniform, nor uniformly low; it ignores such a common biological mechanism as adaptation to sub-optimal or unfavorable conditions; the statement that people with normal salt intake don't notice 50% more salt added to their foods is not even believable. In short, Dahl's basic approach was to include only data supporting his notion of salt toxicity at present intake levels, while dismissing or plainly ignoring what wouldn't fit in. The extremism of Dahl's view shows rather boldly when he puts the effect of present-level salt consumption in the same bag with those of cigarette smoking, most virulent epidemics, or DDT. It is pretty much evident that the objectivity of Dahl's conclusions is a suspect. Despite their obvious deficiencies, this and other Dahl's papers - particularly his graphic "proof" of the dramatic linear relationship between salt intake and rates of hypertension, as well as his experiments on salt-sensitive rats created by genetic manipulation (Influence of dietary potassium and sodium/potassium molar ratios on the development on salt hypertension, Dahl et al. 1972) - greatly helped salt hypothesis to become predominant view in academic circles and, from there, the mainstay of the governmental health policy concerning sodium intake. Prompted by this - and particularly by the negative result of 1984 study based on the National Center for Health Statistics' NHANES I data (McCarron et al.) - NHLBI decided to settle the controversy by proving salt hypothesis correct once and for all. That brings us to the INTERSALT trial, set out to accomplish this task by determining sodium intake and rates of hypertension in 52 population groups spread over 32 countries worldwide. After 4 years of collecting and processing data, the results were published in the British Medical Journal (INTERSALT: an international study of electrolyte excretion and blood pressure: results for 24 hour urinary sodium and potassium excretion, INTERSALT Cooperative Research Group, BMJ, 1988). Study conclusion was that there is a steady positive correlation between salt (sodium) intake and mean systolic blood pressure (MSBP). Specifically, that MSBP drops 1-6 mm HG for 100 mmol reduction in daily sodium intake, and that it does confirm Dahl's basic assumption of the existence of linear, dose-dependant relationship between salt intake and prevalence of hypertension - salt hypothesis. This conclusion did not, however, hold under closer scrutiny. Major inconsistencies with the suggested positive linear correlation between salt intake and blood pressure are rather obvious. Data plot for all 52 sites (graph B), would have a straight line drawn from the approximate average for the two Brazilian tribes to that of the next two closely positioned sites (Papua and Kenya), abruptly broken downward in order to be redirected toward the center of the globular cluster formed by the rest of 48 sites. Better fit would be a curved line with the sharp initial raise in MSBP, but nearly flattening within the cluster. That would imply no significant effect on blood pressure for sodium intake of over ~100 mmol (~5.8g of salt). But either line would be highly superficial, since the four sites with the lowest salt intake just as much differ from the rest of 48 sites in everything else, including a number of possible - and probable - confounding factors. By far more significant in that respect is the cluster formed by the data from these 48 sites. Within it, there are full-range variations in the MSBP level for near-identical salt intake, and the other way around. Excluding four tribal peoples (most left on graphs B, C and D), leaves us with 48 sites in generally civilized societies, without any apparent consistency between salt intake and blood pressure level. 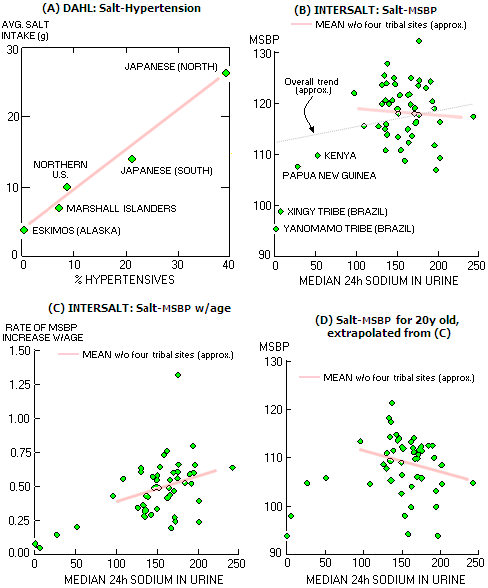 The graph also shows that indigenous people from New Guinea and Kenya - whose salt intake level of 1.5-2.5g/day is near-ideal according to the main-stream salt hypothesis criteria based on no-salt-added diets of our predecessors - have similar blood pressure level as do people from several other sites with 3-4 times higher salt intake. The study made no attempt to explain these obvious contradictions to its data interpretation. Data on the relationship between salt intake and median systolic blood pressure (MSBP) across populations. For decades, the foundation of salt hypothesis was Dahl's plot with only five population groups (A), for which the method of obtaining data was never published. INTERSALT study has gathered data for a substantial number of populations, but it shows significant positive correlation only with four indigenous tribes included; for the rest or 48 sites the original data show negative correlation, i.e. lower MSBP with higher salt intake, although not significantly (B). Note that even for all sites included, and treated as a random homogeneous sample (which it obviously isn't), INTERSALT authors obtained much weaker sodium-MSBP relationship than Dahl's graph (~5% increase in MSBP going from 10g to 20g salt intake vs. tripled rate of hypertension for the same intake range on Dahl's graph). In subsequent adjustments, INTERSALT authors couldn't establish significant positive salt-MSBP relationship for the 48 sites, but did so for the rate of MSBP increase with age (C). However, that statistical trend implies paradoxical conclusion that blood pressure at 20y of age is significantly lower in populations with the highest salt intake (D, from Salt and blood pressure: Conventional wisdom reconsidered, Freedman and Petitti, 2001). These major inconsistencies prompted INTERSALT authors to adjust study's methodology - based on unverified assumptions about the nature of statistical and (urine) measurement errors - with which they managed to turn the trend line for the 48 civilized sites positive, although not significantly; it also led to establishing that the rate of MSBP within these 48 sites increases with age significantly faster with higher salt intake (Intersalt revisited, Elliott et al. 1996). That, however, implied that, regressing to 20y old population, contrary to the salt hypothesis' base premise, blood pressure is lower with the higher daily salt intake. Simply put, after their original analysis showed negative correlation between salt intake and MSBP within the cluster of 48 civilized sites, INTERSALT authors revised methodology of data processing so that it gave desired (positive, if only weakly) association, and presented it as Intersalt Revisited. Brushing aside criticism that the correction had no rational or scientific grounds, NHLBI proclaimed that the study adds to the "abundant" evidence positively associating sodium intake and high blood pressure. "the end justify the means" philosophy. That "end" could be anything from personal benefit to sincere conviction, but at the highest level it is almost exclusively protecting interest, status and influence. And, of course, it is the side backing salt hypothesis that has much more to lose. A few final words about Intersalt. If its goal was to come up with a definitive answer to the question of salt-hypertension relationship, it failed to do so. If anything, it raised more questions, and clearly indicated that if such relationship exists at all, it is neither linear nor simple. For all that its data directly convey, the effect of salt intake on blood pressure doesn't seem to be a significant factor at the level of population. Intersalt study also fell short of making more clear the role of major confounding factors, like sodium-to-potassium ratio (which in the study varied from highly significant to insignificant), type of diet, body mass index, alcohol consumption, socio-economic status, environment or lifestyle. It paid little attention to how median blood pressure levels relate to the actual hypertension incidence rates, and none to how they relate to either rates of cardiovascular mortality/morbidity or the overall life expectancy. The realization that these questions need to be addressed marked a turning point of the new stage of research on the effect of salt intake on health. What it discovered, so far, is presented in more details in the following article.